Keith Curle has moved swiftly to make more changes to the backroom staff at the Cobblers, with head of recruitment Andy Melville among a trio leaving the club. Also on the way out are goalkeeping coach Chris Day, who has been replaced in that role by Dan Watson, and assistant sports scientist Jack Baxter. Day was appointed by previous manager Dean Austin in August, and joins Austin’s assistant Andy Todd in leaving the club following the backroom team shake-up, with Curle also having brought in Colin West as his assistant. Melville leaves the club after more than two years as head of recruitment, having initially been appointed when Chris Wilder was still Town manager, at the back end of the 2015/16 league two title winning season. A club statement read: “Northampton Town manager Keith Curle has reshuffled his backroom staff at the PTS Academy Stadium. “Joining the club is goalkeeping coach Dan Watson. As a player, Watson began at Derby County before joining Wolverhampton Wanderers and then Luton Town. 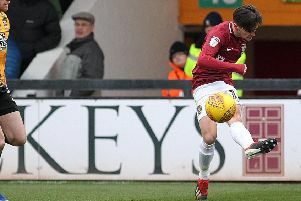 “In terms of his coaching career, he has previously been goalkeeping coach at Port Vale for three years, and joins the Cobblers having most recently held the same position at Carlisle United. “As Watson arrives, previous goalkeeping coach Chris Day departs the club, along with assistant sports scientist Jack Baxter and the club’s head of recruitment Andy Melville. Watson was Curle’s goalkeeping coach at Carlisle United, and it was announced by the Cumbrians earlier today that he had left the league two club ‘for personal reasons’. Having spent more than a year at Brunton Park, Watson, who lives in Wolverhampton, said: “”I’ve really enjoyed my time at Brunton Park and I’ve met some fantastic people through my stay here.